The Tatra V855, better known as aerosan, was created at the instigation of the German Army in 1942. 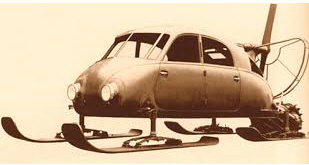 The machine was, and still is, interesting by its unique concept of propeller propulsion and the use of skis instead of wheels. AUTHOR: PETR FILIP, KLUB Veselých Lepičů z.s. The Tatra V855, better known as aerosan, was created at the instigation of the German Army in 1942. The machine was, and still is, interesting by its unique concept of propeller propulsion and the use of skis instead of wheels. This seemingly absurd combination proved to be fit for the Russians planes. However, the development of history has defeated serial production, and only one prototype has come to the world, which we can still admire at the Technical Museum of Tatra. We will focus today on the scaled model of this machine. The parts of the kits contain boxes of a fairly common size, with a rigid cardboard bottom and a semi-rigid lid on which (in my taste) there are no dazzling drawings of two possible color versions of the kit. Dual drawing has its meaning. The kit with the prof parts for just two models. For one of them, they also offer cast-in enhancements, allowing for open-door construction, engine covers and the engine itself. on the propeller gear part. It was more or less the same on both boxes in a box, so it can be assumed to be on all moldings. In the frame of the clear parts, we also find surprisingly some components that do not absolutely need transparency, but it seems likely that all three frames are approximately equally large. The "glass" itself is quite thick and distorts the view. If you build an enhanced version with an open door, you definitely have no chance to use anything other than a windscreen. I'm a little embarrassed from the use of clear brittle mass to a part with braces of the brake cylinder. Yes, I broke them during the construction. I also have some reservations about casting. The braking cylinder in my kit was in one case from an obviously damaged mold, with a part of the slats and a side trim, absolutely enveloped. Here, apparently, an exit check failed because the piece for the second kit is okay. The plastic kit itself works very well, and the main parts surprisingly fit together. A bit of my problem arose on the roof when I simply did not manage to hug parts so that there would not be a visible joint, but on the other hand, where else and more easily binder than here. The partition between the cabin and the engine compartment also comes out just above average just a little harder to sit behind the bench but nothing dramatic. Greater combat occurred with the front seats. I do not know where the error occurred, but the seats are too wide, and after their stuffing into the interior there is no place between the two control levers to be placed there. The seats also do not fit on the protrusions pressed on the floor. Here he wants patience and simply to advise.